LG might’ve been the last major smartphone maker to announce its 2013 flagship smartphone last year, but the wait was well worth it – partly due to the fact that it trumped many of its rivals in several categories. As for HTC, they were actually one of the first on the scene to deliver a top contender smartphone last year – the HTC One M7. Now that 2014 is upon us, we’re seeing the same trend from before, where HTC is one of the first to globally launch its flagship device. 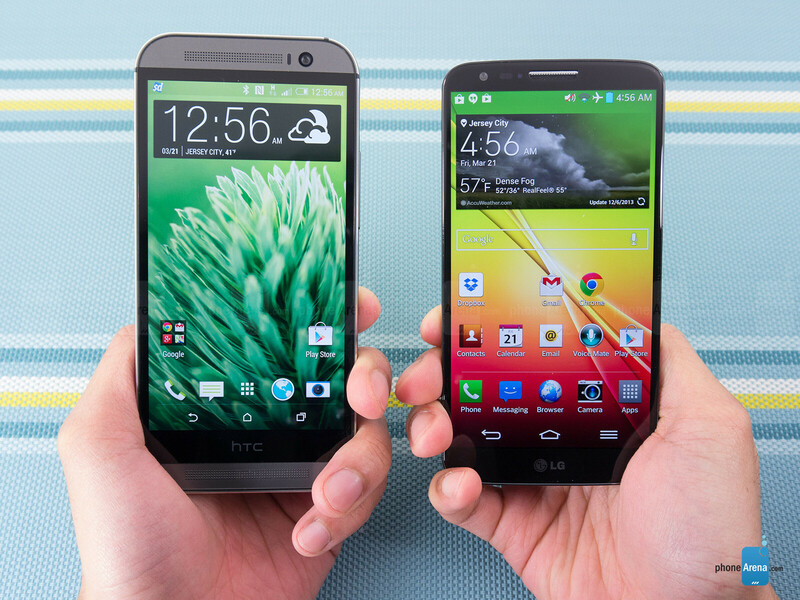 In our next comparison, we’re pitting the newly outed HTC One (M8) against the formidable LG G2. We know that there’s a significant difference between the two, as one is the regarded as a last-generation model – while the other is a part of the current crop. 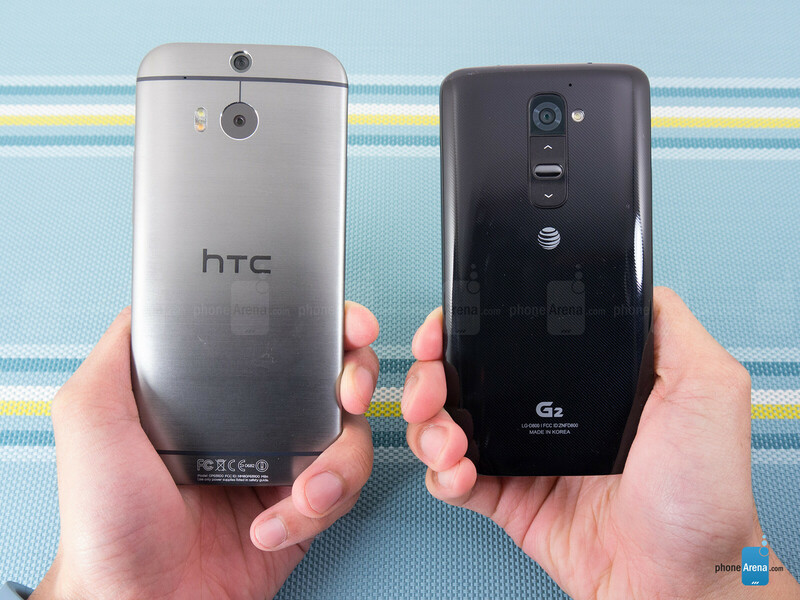 Naturally, there are going to be some advantages with the newer HTC One M8 (think hardware), but that doesn’t mean that the LG G2 can’t stand its ground and give it a good run for its money. Even before we’re able to hold each device in our hand, our eyes can instantly tell us from afar which of the two handsets in question is flaunting the more attractive design. At the core here, it’s plastic versus metal – so we know where this one is heading already. With its body comprised out of 90% brushed aluminum, the HTC One (M8) radiates strongly with that premium touch that we desperately desire in a high-end phone. In comparison, the LG G2’s polished plastic casing just can’t compare, since it lacks the sturdy and solid feel of its competitor. Metal just screams premium, so there’s no hiding the obvious here people. Not only does the HTC One has the superior build quality, but the metallic casing enables the phone to look cleaner – while also repelling nasty dirt and debris. Due to its polished look, the plastic frame of the LG G2 is more prone to being dirtied by those unwanted baddies. 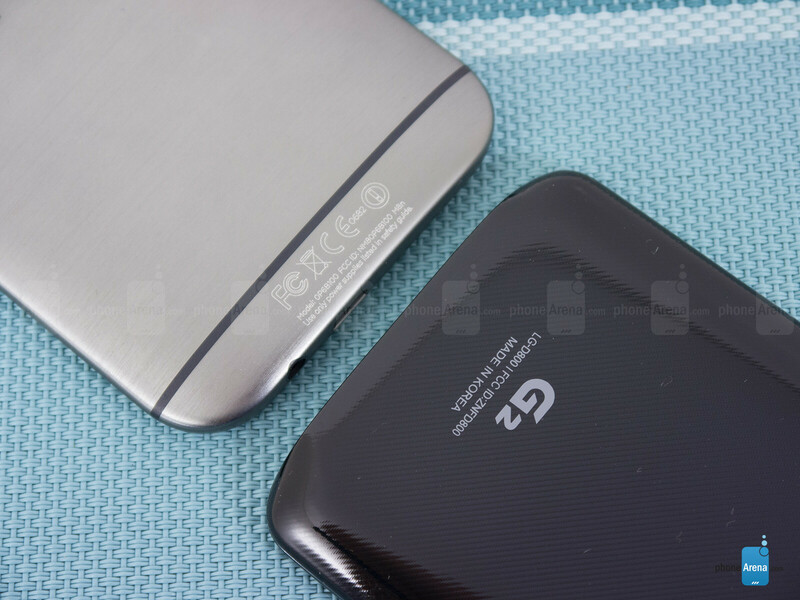 Then again, the advantage with going with a plastic casing is that the LG G2 is both the lighter and more streamlined device. Highly touted for its stylish and stunning design, the HTC One M8 makes the LG G2 look dated, boring, and downright conventional. If you want to raise a few eyebrows as you’re putting your phone to your ear, you’ll surely get more of it with the HTC One in your hand. Alien at first, the LG G2’s placement for its power button and volume control is something learned over time – thus becoming more natural. Still, they don’t compare to the more accessible set of buttons on the HTC One, which are more distinct to the touch and responsive. Looking around their trims, they sport several common ports. Specifically, they include the 3.5mm headset jack, microUSB port, and IR blaster. However, the HTC One M8 benefits by offering us a microSD card slot for storage expansion and dual front-firing speakers. Feasting our eyes on their displays, we’re instantly reminded why we love the two phones so very much – they’re packing along super sharp displays! The HTC One M8 features a 5-inch 1080p Super LCD-3 display with Gorilla Glass 3 protecting it. The LG G2 has a slightly larger 5.2-inch 1080p True HD IPS Plus display with Gorilla Glass 2. Technically on paper, the HTC One’s display boasts the higher pixel density count of 441 ppi, versus the 423 ppi tally of the G2. Honestly though, the difference is negligible, seeing that the two produce sharp visuals from all distances.The One M8 has the better color temperature – 7182k vs 8109k for the G2 - white is only slightly blueish on the One, while the blueish hue is more pronounced on the G2. When it comes to color reproduction, they are on par, although color purists will notice the differences and that both displays are not the most true-to-live. Likewise, they both prove to be great when it comes to viewing them outdoors thanks to their strong brightness output. To tell you the truth, it’s rather tough picking out which display we find more attractive. I loved the G2 when I had it but the build quality was lacking.. it creeked when you put any sort of pressure on it. what do you mean by 'creeked'? It squeeked like crazy and I didn't have a case on it so it was super annoying.. other than that it was a great phone. Really? I haven't heard about this, it's surely terrible. But, still better design than Samsung! With that being said I'm a LG fan regardless. 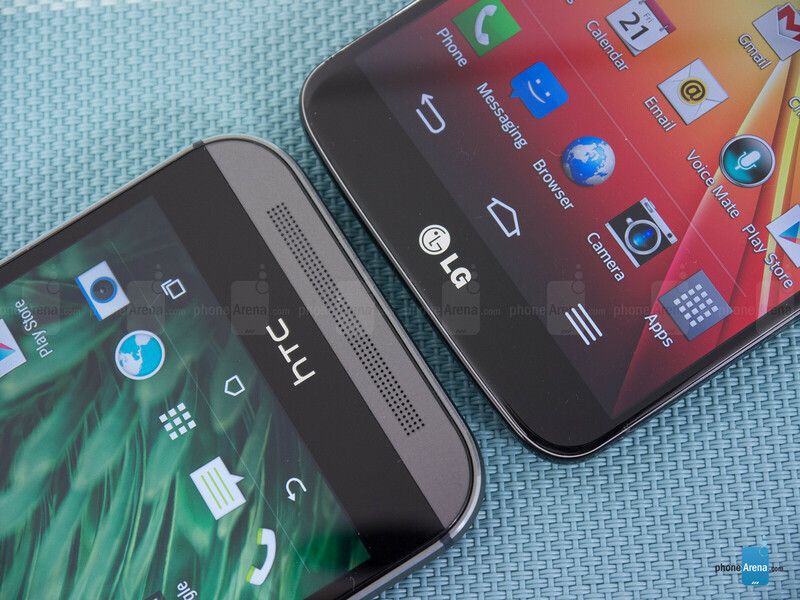 Overall two very nice phones, each with its pros and cons but overall I don't think you can go wrong with either. Although I'm a proud new owner of the M8, I admire how LG was able to create such a large screen in such a compact package. 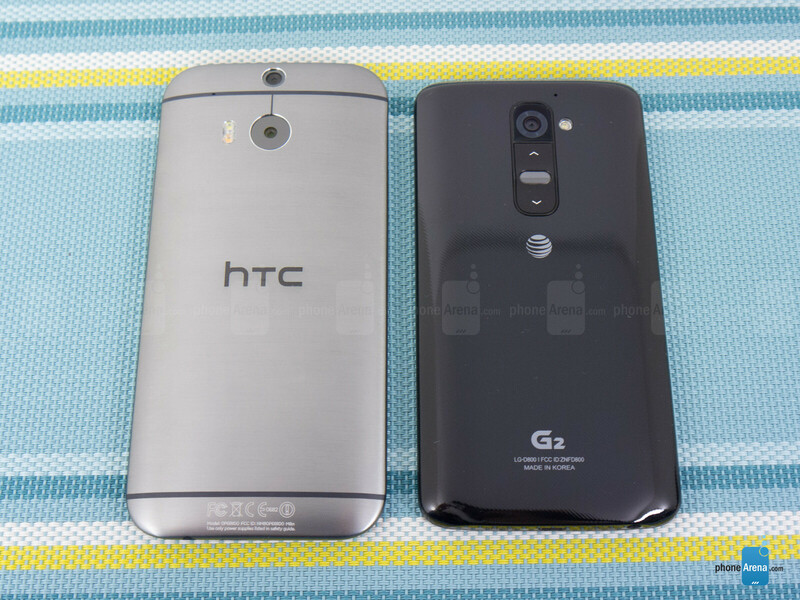 I own the G2 and still wanting the M8! But honestly I can't find enough reasons to do so! All there is, is sound and maybe feel in hand! All the remaining, screen size, overall size, screen/size ratio, battery, software features, camera quality, etc... However, still torn out, I still miss Sense and would really like to go back! But paying additional 300$ (selling g2 used and buying a new M8) is not an option at this time! I wouldnt't trade my g2 for this m8! I like and have had both but prefer the m8.. I do hate the power button on the m8 though.. it's flush and doesn't do well until pushed hard.. I'm all unstable about these two as a longterm user of a phone. The privious one was Samsung GS2, but in a sudden that decided to get retired. Now, in front of me stands a big decision (for me, of course). After a longlasting search and reading a ton of reviews, finally I'll grap one of these guys. I'm impressed by the camera and the interface features of the G2, but by the call clarity, BoomsSound and the ability to display lyrics of the M8. I've not personally tired none of two... Which of the features above gets ahead of the rest? Is the call clarity of G2 much worse than M8? or the camera quality of M8 than G2?